Stanford University climate scientist Dr. Stephen Schneider died unexpectedly of an apparent heart attack while traveling yesterday while on a plane bound for London after attending a meeting in Stockholm. Schneider was Professor of Environmental Biology and Climate Change at Stanford, Co-Director at the Center for Environmental Policy of the Freeman Spogli Institute for International Studies, and a Senior Fellow in the Stanford Woods Institute for the Environment. Schneider, along with his Stanford Biologist wife Terry Root, won the 2003 National Wildlife Federation’s National Conservation Achievement Award. 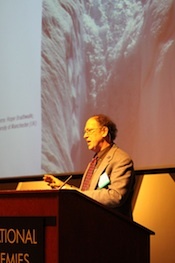 He co-authored more than 450 scientific papers and publications, contributed to all four IPCC assessment reports, and was Coordinating Lead Author for the IPCC Working Group II Third Assessment Report – work that led to his receiving the Nobel Peace Prize a a member of the Intergovernmental Panel on Climate Change. Perhaps Schneider’s greatest contribution was understanding that his work as a scientist depended profoundly on relating that work to non-scientists, from “average citizens” to those in power. He was a consultant to the White House and federal agencies in the Nixon, Carter, Reagan, H.W. Bush, Clinton, W. Bush, and Obama administrations. He was consistently on the front lines of the “debate” on climate change – both real and perceived or manufactured – knowing all too well that the scientific community was always at a disadvantage in explaining such a complex and urgent topic in a world of ten-second soundbites. He described himself as a skeptic – as any good scientist should be – and his work, dedication, and humanity will be missed. It is sorely needed.